What are Quanta installation profiles? One of your best allies, when using Quanta, is the installation profiles feature. You might have noticed, when firstly installing Quanta, that you are not starting completely from scratch... Doctor will ask you which "profile" you want to choose for your application, and that's what will give your application its first imprinting. Difference between the concept of "profile" and "theme"
Installation profiles can indeed be seen as "themes", defining a general layout and structured content, so that the "default" site can be easily personalized in its contents and details. So, a profile is more a full-featured application, ready to be customized. Quanta profiles are subfolders of profiles folder, located in your Quanta installation root. Each time you add a new profile, it will be made available for Doctor, when doing a new site installation. 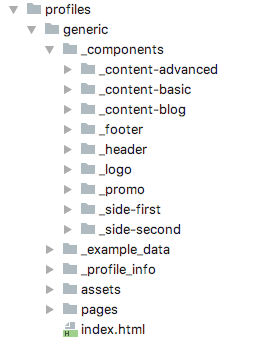 When a profile is chosen at install time, all the files and folders (nodes, modules, roles, etc.) contained in that profile are copied to the newly installed site "as they are". This is the information that Doctor will display at the moment you install a new site. When should you create new profiles? Using profiles is particularly smart when you have to do many websites that are targeting the same business, or - generally speaking - are very similar one to each other. I.e. if your main client are restaurants, you would create a "restaurant" profile, and place there all the related components, such as: daily menu, opening hours, dishes gallery, blog, etc. We would love to have a number of great preset profiles included in Quanta core. Follow up the community, and reach us in github to help us with Yours!